The Reds and Giants are engaged in trade negotiations that are advanced far enough they’ve been described as “serious” according to Zach Buchanan of the Cincinnati Enquirer. A deal could be finished by Thursday when the Winter Meetings in Orlando end. The source said that talks are advanced enoughÃ‚Â that something could be completed before the Winter Meetings end Thursday at the Walt Disney World Swan and Dolphin Resort. There is no indication what the Reds would receive in return. Also, note this report indicates other teams, particularly the Texas Rangers, are talking about Hamilton. It would make sense, if Zach’s source is in the Reds organization, that this was a strategic leak to prod the Rangers. The “could be done this week” quote is suspicious in that regard. Not that the Giants and Reds aren’t far along, just maybe the Reds prefer to deal with the Rangers given that Texas has a much better farm system and trade options. There’s a lot more about the trade in Zach’s column. Go read it all. From our post yesterday:Ã‚Â Here are a few lists of Giants prospects: Baseball America, John Sickles,Ã‚Â MLB Prospect Watch, Fangraphs, Baseball Prospectus. Some of these have been updated more recently than others. Keep in mind that every organization has a Top 10 or Top 20 list. That doesn’t compare the quality to the overall pool. For example, Christian Arroyo (#57) is the only Giants prospect in their Top 100 overall. The Reds have five players on that list: Nick Senzel (#6), Hunter Greene (#18), Taylor Trammell (#68), Tyler Mahle (#78) and Jesse Winker (#100). 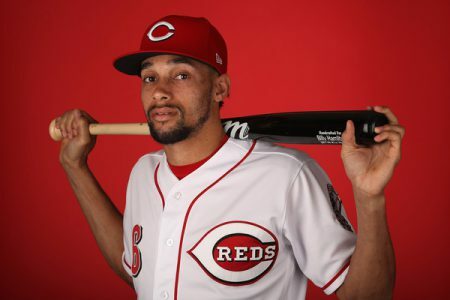 Reds also engaged with other teams other than the Giants on Billy Hamilton. For a big-market team, he would be the ultimate late-inning weapon. DRO: What’s the best-case scenario for Scott Schebler? Worst-case? The interesting piece is that it mentions the Reds would like to sign a CF instead of use Schebler if Hamilton is traded. That leaves the possibility of Schebler or Duvall still being traded. Signing another CF would probably rule out signing any other significant pieces so it would mean the Reds stick with what they have at SS and SP. I think the Reds really believe (or want to believe) that Peraza is the answer at SS. Many disagree, but we are not making the decisions. I also think the Reds either believe they have the arms within the organization to provide a solid, if not top shelf, pitching staff but they are not sure which arms yet. Many also disagree with this point also, but I think they may be correct regarding the pitching staff. I think DW and the powers in the Reds management have seen enough of Hamilton to realize two things: Hamilton is NOT the long term answer and his trade value will only decrease from this point. You can’t have a lineup with both Hamilton and Peraza. They are too similar…I’m more willing to see what Peraza has at this point. I don’t think Billy is anything more than what we have seen. Cozart could at least field his position well when he came up. We can’t say that about Peraza at this point. No bat and no standout glove means no future as a starter. “Have to believe” or “married to belief ” on Peraza. WJ made relatively recent trade to acquire Peraza as future SS. DW would be throwing WJ under the bus if he quit on him now. There also is no Plan B in house. Winker is the #100 prospect…he damn near had a .400 OBP in AAA this year. 100th is stupid? I think they had Castillo rated pretty low too? They’re basing it on subpar defense, lack of power and lack of speed. That said, I am sure his power will be fine as he matures, he is just too big of a guy to be a gap hitter his whole career. He’ll be more like a 40 double, 25 HR type I think, with a very good OPS and OBP. He’ll be “slow”, comparatively speaking and never better than average (if he gets there) defensively, but we all want him starting full time sooner rather than later given our complete lack of any hitters outside Votto with a good eye. Machado wants to play ss, Orioles need pitching. Who goes? Isn’t he a free agent after this year? Yes and the talk is a $300MM+ contract. The Reds have correctly decided that Taylor Trammell and Jose Siri are 2020 options in CF/OF and Billy Hamilton past 2019 is not. So, get some value now. Interesting to see how this plays out. I would like to see an outfield of Siri, Trammel and Hamilton. WIth Ervin off the bench. oh baby! try to find a gap if you are an opposing hitter in that outfield. I’d rather the pitching be better so we don’t have our outfielders stepping and fetching on the screaming line drives we’ve seen given up over the last couple of years. If BH goes, so be it. Hard to be a 1 dimensional player for too long in this league. This is the time when a GM can prove his mettle. 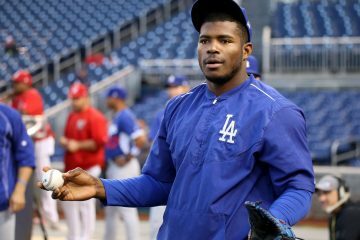 The Giant’s system stinks for real prospects but a couple of very young high risk, high upside players might be a nice ask…Heliot Ramos and Jacob Gonzalez maybe? I just hope we finally see one of those deals go down where the ante kept getting up’d and our GMs didn’t jump at the worst offer or get a great offer and not pull the trigger. At this point, given the high confidence of rumors, to NOT get a deal done would be a major disappointment. Cubs pickup reliever Brandon Morrow while the Cards get reliever Luke Gregerson. I hate to keep beating this drum, but…. Could the Reds be trying to trade for Yelich? If they’re really looking to move Billy, that must mean they are reasonably certain they have a replacement in their sights. There were reports the Cards were trying to get either Ozuna or Yelich. How sweet would it be for the Reds to pip them at their own game? I don’t think so. They feel confident Taylor Trammell and/or Jose Siri are the future and it’s more a rejection of Hamilton as the CF paat 2019 and on the next great Reds team. Assuming that, he needs to be traded now or in late July to get back value. They also aren’t winning in 2018 so there is little reason to put all your eggs in the 2019.Billy Hamilton basket. If that’s true, then what is the short-term solution for 2018? I highly doubt Siri or Trammell will be in CF Opening Day 2018, so what are they going to do? Sign a cheap FA to plug in there and hope one of Siri/Trammel is ready by September? Unless they replace Hamilton, Ervin becomes the 4th outfielder and late inning defensive replacement for Schebler. Be a coup to get Yelich, though, and trade for Machado at ss. Suddenly you have one of the best lineups in baseball. If the Reds were really close to contending in 2018, like projected at 81-82 wins, then trading for one season of Machado would not be the craziest idea in the world. Especially factoring in things like potential dead money at the end of a 3-4 year deal to Cozart, another season to try and work with Peraza’s hitting, etc. No way the Reds could re-sign Machado, entering free agency at age 27. Alas, the moves would deplete the Reds farm system, even if you could get Baltimore and Miami to agree and outbid other teams. And, the projected 10 WAR of Machado (6) and Yelich (4) would only put the Reds at 82 wins, still needing some breakouts and a little luck for a playoff spot. Would be a heck of a fun team to watch for a season, though. They don’t care about 2018. They aren’t winning They will sign a Cameron maybin type. Yeah, it’s wishful thinking. My wife’s family lives in Annapolis, huge O fans, and I’ve been watching Machado for years now. Awesome 3b and plenty of pop. I can easily see him sliding over to short. The only way the Reds could take him would be to get a contract done before he’s a FA. But you’re right, it would be plenty hefty. Have to include Homer’s contract in the deal minimum. But that’s why I keep coming back to Senzel at short. It shores up a weak spot in the offense. Just hope he can play there. Buster Onley is right. Hamilton has little value in a 15-9 game but his Value is through the roof in a close 2-1 game, both at the plate and in the field. I think it would be silly to trade him. plus he is a crowd favorite. Billy Hamilton might a favorite of some at RLN (Havoc! ), but the whole notion of any “fan favorite” and it affecting the Reds financial bottom line is a bunch of bunk. The Reds have never drawn 75% capacity in any season at Great American Ball Park, not the first year there, not the playoff years…none of them. Less than 1.9 million came out in each 2016 and 2017 to see Havoc!, a future Hall of Famer and several young talents. 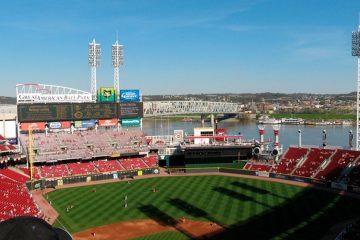 Why the Reds can’t fill GABP, despite bottom 5 MLB ticket prices, is a mystery and something that directly hurts their ability to keep up spending-wise with Cubs, Cardinals and others. Yeah, B-Ham is a crowd favorite, right up until trading him allows a better CF to play and B-Ham is quickly forgotten as we check the stats and see he is hitting .200 for the Giants or whomever and they can’t buy a run to save their life. The trouble with the Olney quote, B-Ham is part of the reason of more 2-1 games and less 15-9 games. He helps a bit in saving a run every other week (no more than that regardless of the silly analytics), but he kills enough potential rallies to cost them a couple of runs each week. “No more than that..” You know this how? It isn’t so easy to measure. You’d have to factor in the effect he has on the corner outfielders’ positioning, for one thing, and that would be, at best, a guess. Also balls he catches easily that would have dropped in front of a centerfielder playing deeper. You can’t know whether that runner who wasn’t would have scored. Then there’s the intangible impact his defense has on the pitching staff. I know, everybody hates intangibles because they can’t be measured. Doesn’t mean that they aren’t real, though. Shifting gears from outfield to infield … how ’bout checking in with Tigers on Jose Iglesias … great glove, okay Bat (think Zack Cozrt BEFORE 2017) … .265 hitter but a terrific fielder and affordable right now at least. Free agent in 2019 … stop gap until Reds find out about inhouse options? Just a thought. With Tigers in full rebuild mode, there’s an opportunity there. I also heard the Giants return offer for Hamilton wasn’t even close to be accepted. It seems like the Reds are using the Giants to get the Hamilton trade done with the Rangers. Let us hope, the Rangers have more interesting prospects. The Giants probably won’t part with their best pitching prospects and after that, they’re prospects stink. Delete this post, Steve. The Reds would never trade Billy, right? Chad, you’re in the same red boat as Mrs. Cossack. When I mentioned this possibility to her, she went directly to denial mode. The Little Cossack began lamenting the loss of Jay Bruce after she got a Bruce T-shirt and now the possible loss of Billy Hamilton with his poster hanging on her bedroom wall. She’s handling the situations much better than the Old Cossack did when Frank Robinson was traded. My son is not happy tonight either. But, for the record, I explained to him why the Reds need to trade Hamilton. Or, at least, why it might make sense to move him right now. I had a good laugh and told him that he should be the Reds GM when he grows up! Hey. I live in Sacramento and from what is being said around here is that the deal was most likely for Hamilton and Duvall and asking the Reds to take money back to help keep them under cap. They want to get under for next year when a couple big contracts come off the books. They want power plus defense and word is they want Duvall back. Do not think that will happen, unless it is a really good prospect. Exactly Cossack, and it would take multiple if we send both Hamilton and Duvall AND take back a bad contract, I mean it would take like #1, #3 and #8 prospect to get us to even think about it. I hope this falls through if that’s the case and on to the Rangers or some other surprise team. This is gospel: Reds asked the Giants for 1st round pick Heliot Ramos in exchange for Hamilton. Giants couldn’t say no fast enough and said Reds asking price was ridiculous.